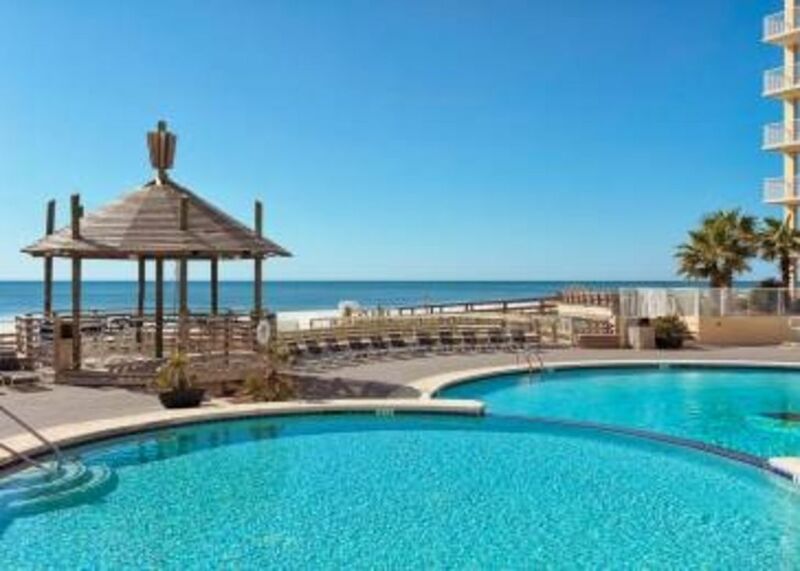 This spectacular, HUGE, BEACHFRONT PENTHOUSE, has approximately 1700 square feet (400 SQUARE FEET LARGER THAN THE NORMAL SUMMER HOUSE CONDO), 3 bedrooms, 2 baths, nine+ foot ceilings, and a FIREPLACE. The south wall is entirely glass and has an awesome view of the Gulf. Professionally decorated with exceptional furnishings, but fine for kids too! Designer tile throughout living areas and under-the-counter ice maker at breakfast bar, granite in the kitchen. Dining table seats eight to ten comfortably. FULL SIZE washer and dryer, four TV's all with DVD players, 5 CD-stereo, board games & library. The beds include a King, queen, and two fulls. FREE HIGH-SPEED INTERNET. THIS IS A WONDERFUL VACATION HOME! All you need to bring is a bathing-suit!! UP-TO-DATE RENTAL CALENDAR!!! Our complex has two brand new outdoor pools, one indoor heated pool, huge hot tub, tennis courts, weight room, sauna, playground, basketball court, shuffle board, meeting rooms, and boat/jet-ski lot. Guarded gate! Walk to ice cream, shops, restaurants, grocery, and amusement park!!! Our family loves to vacation! Our favorite places to vacation are Orange Beach and Park City, Utah (see other listings). We live in Birmingham and it is less than a 4 hour drive to the beautiful white sands of Orange Beach. Summer House is a great complex with one of the nicest pools and a lot of beach frontage. In addition, we have an indoor heated pool, 20 person hot-tub, sauna, fitness center, tennis courts, basketball court, playground & putting green. This is a penthouse unit which is about 400 square feet larger than the typical condos at Summerhouse. We also have taller ceilings a log burning fireplace. This condo comfortable lives 8 people with ample living space for all. We are an easy walk from restaurants, ice-cream, beignets, grocery stores, souvenier shops and an arcade. If you desire, you don't ever have to get in the car once you get here!! We loved the complex but our unit was not up to par for what we payed. The unit we stayed in didn’t have a balcony just large nasty windows that needed cleaned in a bad way. This was not advertised as no balcony. The unit was very dated other than updates in the kitchen. The bedrooms had nasty old carpet. The furnitue was old and broken and needs replaced. All our sheets had holes in them. None of the rooms had lights with working light bulbs we had to go buy light bulbs the first day. The ice maker didn’t work just dropped water all over the floor. We called maintenance and they said I️t had been turned in many times but she still hadn’t fixed I️t. Overall we loved orange beach and the complex but will absolutely never ever stay in this unit again. Compared to several other units we saw we overpayed for what we got. Sorry you were not happy with our unit. You made me aware of the holes in the sheets & lightbulbs and I had my maid service bring new sheets the same day. The linens are theirs & I have asked them to replace any linens in poor condition. I reimbursed you for the lightbulbs that you purchased & I contacted maintenance to unclog the slow draining guest tub. All these other items were never even mentioned and I was unaware of. By the end of summer, some things do end up broken, but we don’t know unless our guests tell us. We are going there in about 10 days and will get the unit back in tip-top shape. Our ad states that the beachfront wall is an entire wall of glass, sorrry you missed this. I’m a little surprised by your poor review since you begged to stay an extra day or more. I booked my family's Fourth of July vacation months in advance. I was extremely disappointed in the treatment by the owner. We arrived at check in time of 3pm and the room was disgusting, had not been cleaned. No linens, filthy toilets, etc... I contacted the owner and she said the maids would be there in 20 minutes .. I sent my family down to the beach because I didn't want to leAve our valuables and belongings. May I add I have a leg that is broken in three places and I'm unable to do much for myself. The maids didn't show up and I tried to contact the owner for 3 hours ... I even had to open s complaint with the vrbo site because I was about to have to go buy my own linens .. they were not happy with the disappearance of the owner either. The maids finally showed up at 530 and finished cleaning at 6:30pm which is when the owner finally contacted me to see if they had arrived... I couldn't even use the toilets in the condo while waiting in the maids. I explained to the owner the absolute horrible start to the vacation and she agreed to pay 100 back , I asked for the first night to be refunded due to the poor treatment and she told me I could leave but to please be out by 930 pm. I of course told her 100 would be fine because it was the Fourth of July the next day and where would an injured person and her husband and kids find on such short notice ? I am sorry for this customer's broken leg and her difficulty. This customer could not be satisfied. She tried to cancel the reservation due to her broken leg and her family asked her not to, I believe she wasn't happy to be there from the beginning. She is correct, my maid service somehow missed that they were to clean. After speaking with the customer, I immediately spoke with my maid service and they told me they would be there in 20 minutes. I immediately contacted the customer and apologized for the delayed cleaning and let her know they should be there in 20 minutes, we spoke 3 more times between then and 3 hours later. So I was definitely available. Unfortunately, the maids didn't get there for 2 hours. Because of this 2 1/2 hour delay, I reimbursed the customer $100 even though her family was using the facilities the entire 2 1/2 hours while she sat with her broken leg watching the gulf. She was not satisfied with this and wanted a full day refund on a 3 night stay. I explained that was not reasonable and that I would completely refund their entire stay if they decided to go home that night. She apologized to me and admitted that she was frustrated that she was not going to be able to go to the beach during their stay. I have communicated with my maid service and they have assured me they won't miss another cleaning. My family thoroughly enjoyed our week in the this fantastic condo at this amazing beach. It was very clean and comfortable and the location was excellent. I didn't want to leave! We've stayed at this condo twice now and have loved it! The owner is so great to work with. We love that it is right on the beach and so spacious. Glad you had a nice time, thanks for your nice review! Clean, very convenient location and very nice place! Great place, my brothers and my family stayed there and it was great. I personally love the way the condo is decorated, I think some of the ocean and beach themed decor looks silly and ridiculous, this place was nice and comfy. Plenty of room, very clean, great location, great price!!!! We will be repeat guests. Great views - large unit!! We were only there for a long weekend, meeting up w/ family. Summer House is perfectly located and property well maintained This particular unit is perfect as it is large and layout well done. There is no balcony since unit is on the top floor, but large windows w/ awesome views! Didn't mind not having balcony as weather was really hot and several little ones w/us that we didn't want going in and out on a balcony. That being said this unit does have numerous maintenance issues. We were in touch w/ owner on several of them (and did get quick response to text). The worst issue being a constantly running toilet that wouldn't flush.as tank could not fill up. She did say maintenance was notified, but unfortunately they were off that weekend and by the time the offer was made to contact a different maintenance service on Monday we were already checked out. The other "issues" were mentioned and she said she would have maintenance take care of those as well. Karen, Glad you had a nice stay. We were at the condo right after you and all of the maintenance issues have been taking care of. Thanks!